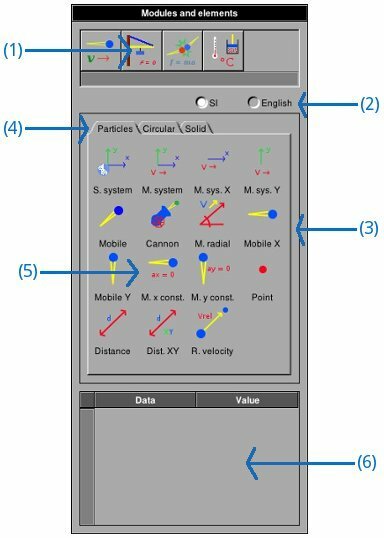 FisicaLab is an educational application to solve physics problems. Its main objective is let the user to focus in physics concepts, leaving aside the mathematical details (FisicaLab take care of them). This allows the user to become familiar with the physical concepts without running the risk of getting lost in mathematical details. And so, when the user gain confidence in applying physical concepts, will be better prepared to solve the problems by hand (with pen and paper). FisicaLab is easy to use and very intuitive. However, in order to take advantage of all its features, we recommend you read first these help files. FisicaLab display two windows, one named Modules and elements and other named Chalkboard. The first of these windows, contain all modules that can be used to solve problems. These modules are grouped by: kinematics, static, dynamics, ... (see image below). You can select one of these groups with the buttons at the top of the window, marked with (1) in the image. When you leave the mouse’s cursor above one of these buttons, a label with the group name is displayed. The buttons marked with (2) let you select the system of units, SI or English. You can see the modules of the selected group inside the box marked with (3). The tabs marked with (4) let you select one of the available modules. The elements of the selected module are displayed inside the box marked with (5). This elements let you set the problems. Inside the box marked with (6) you can write the element’s data (if any element is selected, this box will be empty). 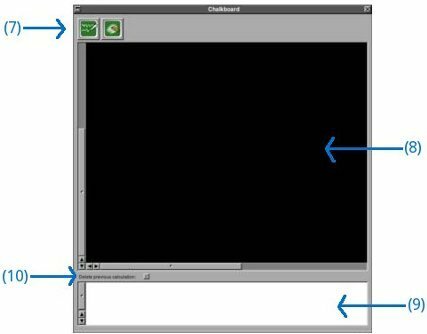 The window named Chalkboard (see image below), have at the top two buttons, marked with (7). The button at the left let you solve the problem, and the other is to clean the chalkboard. The black box marked with (8) is the chalkboard, where you add the elements to set the problems. You need keep in mind, although you can’t see, that the chalkboard is a grid formed with cells of 50x50 pixels. By default the chalkboard size is 26x18 cells. In Preferences panel you can change the size to a maximum of 100x100 cells (A greater size than the default could be useful for trusses problems). The text view marked with (9) is where FisicaLab show the answer and messages. The checkbox marked with (10) erase the content of the text view before show the next answer or message. If you want keep the previous content, unselect this checkbox. In this case you can add notes to identify the results of the different problems.